Enchanting Gythio is a town that you have to visit. According to Greek Mythology, Hercules and Apollo fought over its possession. Neoclassical buildings, the City Hall, the Girls’ School, and the Roman Theatre are some of the places to visit when in Gythio. One of the things that make Gythio special is island “Cranae”. This small island is connected to the mainland through a jetty. It is said that Paris and Helen of Troy spent their first night together there. Paris left his helmet there and this is why the island was named “Cranae” (“ Κράνος”- cranos is the greek word for “helmet”). Nowadays, the island is known for the Tower of Mavromihalis as well as a lighthouse made of marble. Mani is unique place of raw beauty. 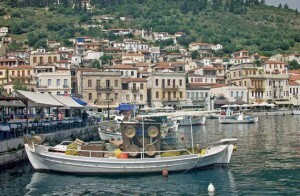 Areopoli, Vathia, Limeni and other villages are to be pointed out when referring to Mani’s culture and architecture. Diros Cave is considered to be “the jewel of Mani”. It is half-filled with water, so you must go through it by boat. It is one of the most beautiful caves in the world. Pasavas Castle is also the place to visit when in Mani. The ruins of a castle built by the French still remain and it is also said that an ancient city named “Las” is buried there. In Sparti lies the “Olive tree and Greek Olive Oil” museum, that depicts the “know-how” of olive oil production. The museum is unique and it is located in the center of Laconia. Mystras is a town full of castles only 6 kilometers away from Sparti. The imposing walls, the palace that belonged to the Paliologos family, the residencies, the Byzantine churches as well as the castle are breathtakingly beautiful. Within an hour-long driving distance, you will find yourselves in Monemvasia so that you can visit its famous castle. Elafonisos lies in the southeast end of the Peloponnese, only 570 meters away from the coast of Pounda. It is certainly a place to be admired, especially for its golden beach. Kithera is an island 2,5 away from Gythio. For further information concerning the timetable and the tickets please contact ROZAKIS TRAVEL AGENCY (t. 27330-22207 / 22650).